I imagine most of you out there in library-land have spent a lot of time curating a social media presence for your library. Whether it’s a robust Facebook page or regular tweets, I know many of us have embraced social media and all it has to offer. And while the benefits are many (having a new way of engaging patrons and even nonpatrons, increasing awareness of your services, etc. ), there are some aspects of social media that present challenges. For us at Capital Area District Library (CADL; www.cadl.org) in Michigan, one of those challenges was establishing some guidelines for use and setting a policy. CADL has 13 branches and a bookmobile to serve 23 municipalities (with a population of 238,859) in Ingham County. We created our first social media policy in June 2009. Of course, social media had been around for a while by then, but we were just getting our feet wet. We had created a position for a “new web media coordinator” earlier that year, and our new hire worked with our director to draft our very first New Web Media Policy. At this point, we already had some staff working on library blogs, and this had generated some questions: How should we handle comments from patrons? What if they say something negative? Is this OK? The second item was intended to provide a framework for choosing which social media tools we wanted to officially develop for the library. This gave us something to refer to when staff asked about whether or not we could create accounts with a wide range of social media services. 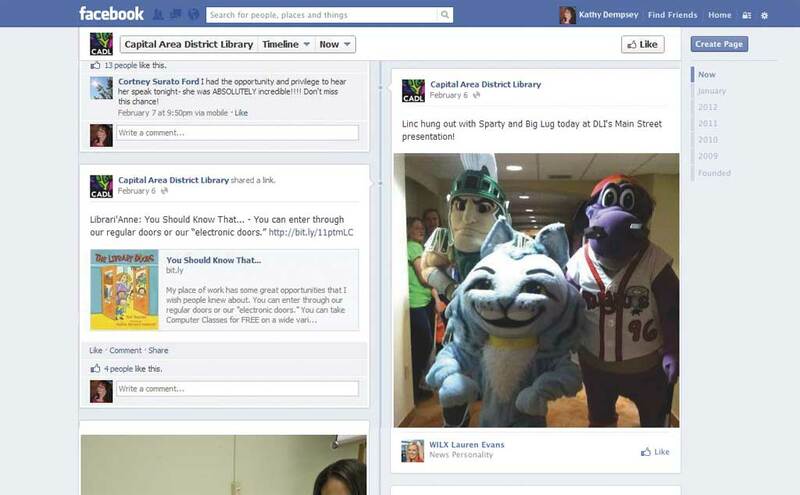 Here’s what some of CADL’s Facebook Timeline displayed recently. There were no questions as to whether or not we should actually be using social media, so we created the policy and had it reviewed and passed by the board in a couple of months. Once it was finalized, we got busy establishing ourselves on WordPress, Facebook, Twitter, YouTube, Flickr, and Myspace. We created content plans for each tool so that contributors would understand the expectations and have guidelines for their posts. We experimented with different tactics to generate buzz and to gain new fans/friends/likers/followers. Our contributors were excited and happy to participate, and the results were awesome. While we achieved some significant milestones and really increased awareness of the library via social media, we knew there was much more potential for us. To improve our game, we needed to revisit our social media policy and make some changes. In early 2012, we started work on our new social media policy. I wasn’t surprised to see that the vast majority of our June 2009 policy was already irrelevant. Our use of social media had substantially evolved, and in the space of 2 years we had redefined the role of our new web media coordinator and changed the position title to “online content coordinator” to better reflect that. We also redefined what we hoped to accomplish by using social media to interact with our communities. Additionally, the 2009 policy didn’t address some of our more recent concerns about the staff’s social media usage. Of the four goals, the top concern was staff use of social media, in particular how to manage the gray area of staff using their personal social media accounts to promote work-related events, services, or resources. For instance, a librarian posted on her personal Facebook page that there was a story time coming up at her branch. She tagged Capital Area District Library so that it would appear on our wall and then also tagged some of her regularly attending patrons (who also happened to be friends) so they’d see her post as a reminder. While we were thrilled at the idea of her tagging the library, we were concerned about the tagging of patrons, for privacy reasons. Our thinking was that we would never publicly identify patrons in our libraries, so why would we do that on Facebook? The first phase of our research concentrated on trying to find some information that would help us determine how much latitude we had to regulate staffers writing posts about the library from their personal accounts. Pickings were slim. Some libraries didn’t have social media policies. Others only addressed one aspect of using social media. We quickly discovered that no two policies were the same and that there really were no commonalities as you sometimes see for other types of library policies. We also consulted with the library board and staff. We shared a preliminary draft of our policy, which generated a lot of questions, particularly from staff, because it dealt with personal versus professional use. • Can I post on my personal Facebook page that there is a program coming up at the library? • Can I talk about my job on my personal Facebook page or Twitter account? • What is OK and not OK to say about CADL? 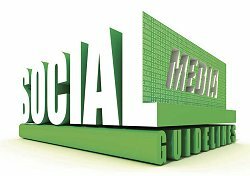 • Do I need to use a disclaimer on my personal social media accounts? Staff members were also concerned that the tone of the policy was too friendly, resulting in vague terms. The board was concerned with covering all of the legal bases. At this point in the process, 3 or 4 months had elapsed, and while it yielded more questions than answers, it was a very worthwhile exercise. We did another round of research that resulted in the discovery of Cleveland Public Library’s social media policy. CPL’s policy was the closest we had come to what we were trying to craft for our own policy. I contacted Joyce Dodrill, CPL’s chief legal officer, who was a huge help. She explained certain aspects of her library’s policy to me, in particular the section on employee usage, and agreed to let us base some of our language on what was in CPL’s policy (www.cpl.org/TheLibrary/UsingtheLibrary/PolicyontheUseofCPLsSocialMediaSites.aspx). We also met with the person who is responsible for managing all of the state of Michigan’s social media accounts. A great benefit of working in Lansing, our state’s capital, is being so close to a wide range of experts. She was also incredibly helpful and provided some great common sense guidance for us. Her main message was that social media is just another communication tool and that we shouldn’t treat it differently just because it’s new. She shared an article with us that explained how careful employers need to be about restricting the rights of employees. We found attorney Brian Heidelberger’s article, “Eight Ways Your Employee Social-Media Policy May Violate Federal Law,” very instructive (Advertising Age, June 12, 2012; http://adage.com/print/235313). Policy statements that prohibit employees from posting about their company or that prohibit “friending” other employees are considered illegal. This was a real eye-opener for us and helped us better shape our policy. Last but certainly not least, we consulted our legal counsel to make sure everything in the policy was appropriate and didn’t infringe on the rights of our staff. After checking the final items, we reviewed the new policy with the board, and it approved the statement at its December 2012 meeting, which was 9 months after we started our initial review of the old policy. The finding that most dramatically changed the way we think about social media usage was the idea that social media is no different from any other communication tool. We just happen to treat it differently because it’s still relatively new. Initially, this was puzzling to me. Social media sure felt different to me—having the ability to share whatever I want, whenever I want, with whomever I choose to friend/like/follow felt very different than calling my friend or emailing my brother or paying a visit to my neighbor. Granted, the immediacy of social media, along with the ability to reach a large audience in a very short period of time, are the two key ways that social media is different. But when it comes to everything else, I think social media is simply another communication tool. If you consider this idea, then I think decisions about how to manage it become clearer. The etiquette rules that we apply in traditional situations should still ring true for social media. That idea alone made it easier for us to answer the questions we received from our board and staff. MLS readers can access our complete policy at www.cadl.org/about/policy/socialmediapolicy. The road we’ve taken to arrive at our current social media policy was lengthy with unanticipated turns. But in hindsight, I’m glad it was. I’m proud of our work and pleased that we have a good, sturdy policy to help guide us into the future. Elizabeth Breed is the marketing and communications director for Capital Area District Library in Ingham County, Mich. She has a B.A. in business administration from the University of Michigan–Flint and an M.L.I.S. from Wayne State University in Detroit. She brings 8 years of consumer and business-to-business market research experience and 9 years of public library experience to her job. Her email address is breede@cadl.org.